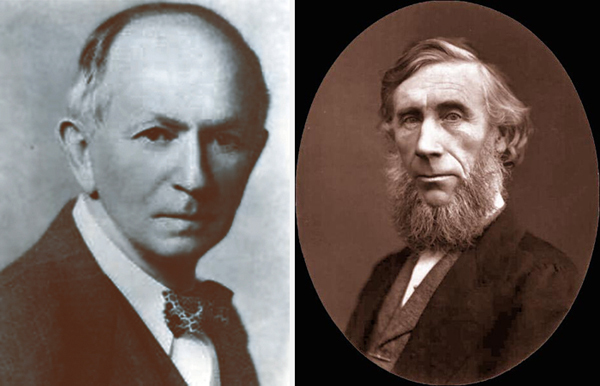 Alfred James Lotka (left) and John Tyndall, from the days when we accepted greenhouse science. More than 150 years have passed since the Irish physicist John Tyndall announced his discovery that water vapour, carbon dioxide and methane, though they form a tiny part of the atmosphere, keep us from freezing at night. That’s the greenhouse effect. It’s 86 years since an American biophysicist, Alfred James Lotka, calculated that at the rate humans were burning Earth’s energy capital — “evaporating” coal into the air, as he put it — the atmosphere’s natural balance would be fundamentally changed. This is the sort of information that generations have taken in and — until recently — adopted as fact, like Newton’s laws about how the universe behaves. We’ve even come to accept (without necessarily understanding them) the mind-bending notions of quantum mechanics. We accepted these ideas because from an early age we also learned about the scientific method. Newton, Tyndall and Lotka worked within this sceptical tradition, in which an idea is never taken at face value but scrutinised and tested in every detail. If it doesn’t stand up, it’s discarded. The theories of greenhouse warming and the consequences of burning fossil fuels have withstood decades of rigorous, painstaking scrutiny. The findings of Tyndall, Lotka and many others fit with current observations of a rising global mean temperature trend which science, despite its best efforts, can explain only in terms of human impact. This is where most European governments and opposition parties have settled. They have accepted the expert advice of the world’s scientific academies drawing on the peer-reviewed research, and now have an established (though still-developing) suite of policies to address it. The United Kingdom, France, Germany and about 90 other countries around the world have legislated for carbon pricing schemes of one sort or another, which their leaders assert are now starting to bring down emissions. Far from leading, Australia is currently in the bottom half of the pack. European visitors to our shores, like European Commission president Jose Manuel Barroso and climate commissioner Connie Hedegaard, who were here last week, seem surprised that some Australians still believe that in debates about carbon emissions there are two legitimate sides. University of NSW astrophysicist Michael Ashley is one of many scientists who find this belief hard to take. A week ago on the blogsite The Conversation, he made it plain he’d had enough. “On one side of the debate,” he said, “you have 97 per cent of the world’s published climate scientists and the world’s major scientific organisations, and on the other side you have fools. Such sentiments would get an airy dismissal from Christopher Monckton, a.k.a. Viscount Monckton of Brenchley. He’s recently been telling any Australian who’ll listen that the world will warm only marginally, that anyway our lives will be much better for it, and that climate scientists are telling lies so that they can get rich at taxpayers’ expense. Monckton, who claims to have scientific expertise but has no tertiary science qualifications, is considered in his homeland to be about as nutty as they get in the English aristocracy. In Australia he is presented as a hero, a defender of truth and commonsense against scientists’ self-serving lies. The reception given by rapturous Australian audiences to Monckton’s quackery is paralleled in the United States and Canada, where the far right of the political spectrum — Tea Partiers and their like — have welcomed him with open arms. This isn’t about factual information. It’s about politics, psychology and corporate self-interest, which together are conspiring to rob us of crucial time in the battle to stop global warming. In Europe, where mainstream political parties accept the science behind human-induced climate change, it’s hard for opposing sentiments to get a toehold. Here in Australia, a lack of political unanimity has opened a door for mining, media and other corporate interests to give multiple platforms for contrarian lobbyists such as Monckton to press their phoney claims. We believe what we want to believe. Like our North American cousins who share with us the dubious distinction of being the world’s leading per-capita carbon emitters, Australians seem well and truly hooked on fossil fuel — or at least on the idea of its unconstrained use. For some people, the thought of having their access to this addictive energy source restricted in any way is dreadful enough to push them into the contrarian orbit, lulled by the assurances of people like Monckton that they can burn as much carbon as they damn well please. Fuelled by vitriol about climate scientists, and using do-it-yourself junk science to support false claims, the whole shebang then turns with fury on anyone who dares to say otherwise. Hence the spiteful, vengeful, ill-informed comments on climate science media reports and blogsites, and the ill-disguised aggression in the recent spate of “no confidence” political meetings around the country. It’s 1950s McCarthyism in a new guise. Rejecting the clear evidence that we have a problem and accepting instead the snake-oil messages about scientists on the make, these people have abandoned any respect for science. In a country that claims its educational standards are second to none, that’s pretty hard to swallow. This entry was posted in astrophysics, atmospheric science, Australian Academy of Science, Australian politics, carbon, carbon emissions and targets, changes to climate, climate politics, climate system, coal-fired, contrarians, economic activity, education, emissions trading, energy, environmental degradation, fossil fuels, future climate, human behaviour, leadership, natural climate influences, organisations and events, psychology, public opinion, science, scientific institutions, social and personal issues, social mindsets and tagged Alfred James Lotka, astrophysics, atmospheric science, Australia, Australian Academy of Science, Australian politics, carbon, carbon emissions and targets, changes to climate, Christopher Monckton, climate change, climate politics, climate system, coal-fired, Connie Hedegaard, contrarians, economic activity, education, emissions trading, energy, environmental degradation, fossil fuels, future climate, global warming, human behaviour, Isaac Newton, John Tyndall, Jose Manuel Barroso, leadership, McCarthyism, Michael Ashley, natural climate influences, organisations and events, psychology, public opinion, science, scientific institutions, social and personal issues, social mindsets, Tasmania, Tea Party, Viscount Monckton of Brenchley. Bookmark the permalink.